Necoichi Cat-Headed Scratcher Bed Review - Check this Scratcher out! “If I fits, I sits.” This adorable cat scratcher bed is the perfect size for sitting, napping, and playing. The corrugated cardboard construction is not only durable, but it’s a cat’s favorite material for scratching and claw sharpening, so it’s a cat bed that may even save your furniture. Cats love boxes, and this bed is the ultimate box upgrade to please any cat. The Necoichi Cat-Headed Scratcher Bed is a cardboard cat bed that cats love to sleep in, play in, and sharpen their claws on, making it a fun and natural way for your cat to feel at home. It comes in a choice of several cute colors and patterns ideal for cat lovers, as well as in a choice of normal or large size, for big cats or multiple cat households. The sturdy scratch-able material has soft edges for cat’s comfort, and it’s made using a safe, non-toxic, cornstarch-based glue. The sturdy bed can withstand years of scratching, helping your cat relax, stretch out, and curl up in comfort and safety. Who is the Necoichi Cat-Headed Scratcher Bed for? This product is for cats and their owners who want a cute stylish cat bed. Cats are naturally attracted to cardboard boxes, but they don’t always look attractive in home decor and don’t stand up well to cats sleeping, stretching, scratching, and playing with the box. The Necoichi Cat-Headed Scratcher Bed is rugged and durable enough to stand up to years of scratching and use, but also attractive and appealing in any room in the home. It’s a great choice for active cats that play rough with their toys, for cats that are shy and prefer a sleeping spot where they feel safe, and for people who want a cat bed with great style. Although it is made of a scratch-friendly material, the Necoichi Cat-Headed Scratcher Bed may not function as a perfect scratching post for many cats. Many cats prefer to scratch and stretch their bodies at the same time, and the design of this bed doesn’t allow for the elongated spine posture of a more traditional scratching post. While it is scratch-friendly, and cats will enjoy scratching it, it may not always be a solution or substitute to keep cats from scratching furniture. What’s included with the Necoichi Cat-Headed Scratcher Bed? The Chalkboard Limited Edition of the Necoichi Cat-Headed Scratcher Bed comes with four colors of chalk, so you can personalize the cat bed any way you like, and can change it whenever you like. Included sticks of chalk are white, blue, red, and yellow. Your kitty will love this two-in-one bed and scratcher, invented with her happiness at heart. Ideal for napping, scratching, and flexing tired kitty paws-all in one spot. Casual, modern design slips easily into any home décor without disrupting your furnishings. Crafted with glue made from natural corn starch, making a chemical-free, non-toxic space for your cat to chill. If your cat is a bit on the generous side in terms of size, it’s best to get the large size of the Necoichi Cat-Headed Scratcher Bed. Again, most cats love this bed and will sit however they fit, but bigger cats may not have enough room to settle down and nap comfortably in the bed. Also, it’s not big enough for two cats, and many owners find that cats will compete for time and space in the bed. If you have multiple cats, it’s a good idea to get an individual bed for each of them. Plus if your cat doesn’t immediately express interest in their new bed, you may want to sprinkle it with some catnip to encourage them to engage with it. And if your cat is a determined scratcher, it’s likely that little pieces of cardboard will come off of the bed as they use it. This is part of the purpose of the bed and intended to prevent them from scratching more fragile items, like carpets and furniture. However, you may need to clean up the area with a sweeper or small vacuum from time to time. For a cat bed that is a little more scratch-friendly, and a little less cute, the PetCheer Bowl Shape Cat Scratcher Lounge is a similar bowl shape, but has the scratch-friendly corrugated surface wrapped around the exterior as well as the inside, so that cats have more scratching surfaces and optional play positions. 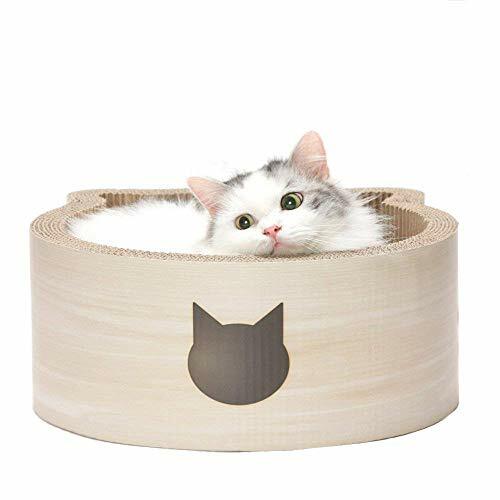 Like the Necoichi Cat-Headed Scratcher Bed, the PetCheer Bowl Shape Cat Scratcher Lounge is sized for a single cat, durably constructed and recyclable. It has more scratching surface and comes with catnip. But it isn’t as appealing a design as the Necoichi. Cats do love sitting, sleeping, scratching, and playing in cardboard boxes. The Necoichi Cat-Headed Scratcher Bed is a great way to give them their favorite toy, but with a cute and stylish upgrade that looks great in any room of the house, and a more rugged, durable construction for years of use. It’s a great size for cats to curl up in for a nap, or tuck themselves away to hide. The cardboard material is perfect for scratching and playing and can withstand tough playing and hard scratching without losing its good looks. The many design options let you choose a look that works best in your home and conveys your personal style, and you could also choose different styles for different rooms in your home, or different cats in your family. Cats love this adorable scratcher bed, and you will love how happy it makes them.